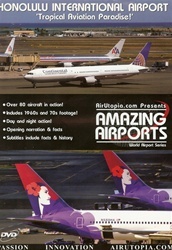 JOIN US in EXOTIC Hawaii... Midway across the Pacific Ocean lies one of America's greatest and most exotic airports - Honolulu International Airport! 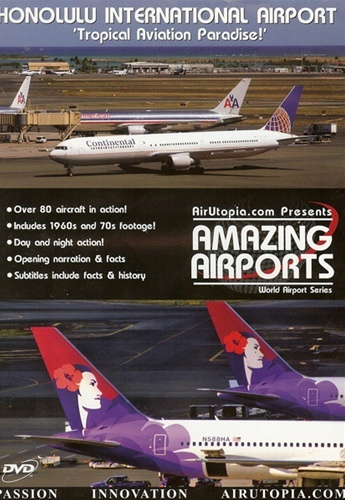 AirUtopia brings the best of Hawaiian aviation to you with a wide assortment of modern aircraft along with classic 'Flashback' footage from the 1960s and 70s. You'll see everything Honolulu has to offer, from JAL Boeing 747-200s and 300s to and the US major's widebodies to local airlines Aloha and Hawaiian! Limited production aircraft such as the elusive Boeing 767-400 and 757-300 are seen in operation by Continental, Delta, ATA and Northwest. Enjoy the best of HNL! Over 80 aircraft in action! Includes 1960s and 70s footage! Run time is about 90 minutes. Format is NTSC DVD and Region-Free.